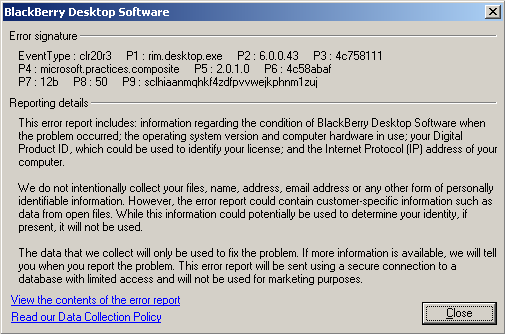 The recent update to BlackBerry Desktop Software (version 6.0) is hazardous and will mess up your install causing you to have to manually scrape it from your computer and revert back to the version you have on disk (most likely, 4 or 5). Be warned, you’ll get errors when launching the application that will prevent it from starting. go go gadget error reporting! If you have earlier versions of the software and are prompted to update…my advice is to NOT update it. Unless you’re a fan of fail…then by all means give it a go. Let’s say you’re an exchange administrator and you use EAS (Exchange Active Sync) to plug smart phones into your Exchange environment. You’re probably one of the many out there who do this…I do it in my environment. You get a nice little list of stuff right? This should be every single EAS enabled account that has a phone synching with Exchange right? Wrong. It absolutely is NOT an accurate list of phones that have synched with your Exchange server. When I executed that powershell scriptlet above on my system it reported back quite a few phones…but my phone, a HTC Evo, was not on the list. In fact, my account wasn’t reported on the list. This despite my device synching just fine every 15 minutes. The integrity of this ‘report’ has been challenged. So what’s the deal? A quick investigatory glancing at google brings little results…However, I did notice when using the EMC to highlight my account and going to ‘Manage mobile device” I was in for a suprise….because that link wasn’t there on my account. That’s right, “manage mobile device” is missing on my account. This despite having Active Synch enabled under the ‘mailbox features’ tab on my account and despite having my device pair up with Exchange in 15 minute intervals. Searching google for this problem yeilds much better results. It seems that a flag embedded for a value in Active Directory doesn’t toggle correctly OR isn’t added into AD at all (perhaps bad replication). Either way, it means you’ll be whipping out trusty adsiedit.msc (per the forum thread linked to above). The setting that needs toggled is “msExchMobileMailboxFlags” which should be set to 1. After setting this, you’ll be able to manage the mobile device AND your synch will be picked up by the powershell report above. The real crux of the matter is that this toggle shouldn’t have to be set at all and regardless if it is set or not, powershell should be able to report if a device is synching with Exchange. There is a reason why RIM is #1 when it comes to businesses and smartphones…it’s because you can have 100% accountability for what is on your network at any given time. With Exchange 2007 and above, it is unfortunately, much like a ring toss at a circus…sometimes you get a ring on that bottle and win a stuffed giraffe but other times you’re going home without plush pals. Microsoft has a problem here because you can’t trust your own powershell queries. If it doesn’t work for this individual area (phones, EAS) then what else doesn’t work? Do we call into question the entire integrity of all powershell commands and commandlets? What do you think? I know this workaround is pretty silly on a huge environment with multiple user containers in AD or even mutlipe forests. Is the workaround something that is tolerable or should Microsoft do more to fix this broken part of their product? My grandfather always says to work “smarter and not harder” which is 1930’s speak for be more efficient. Why couldn’t Microsoft have listened to him (and all the other grandpa’s of the world who say the same aphorism)? I had a user come in the other day with a Windows Mobile HTC Touch Pro 2. They wanted to hook up to EAS and have all the whiz bang features that my Palm Pre and all the whiz bang features that iPhones are able to have…synchronizing calendar, contacts, and email. This user is by no means very technical. They need a way to plug in their email address and server name and have it just work…much in the way that it does for the Palm Pre and iPhone. I anticipate this for some phones…on some phones you have to copy across a root certificate in order to have them connect to a SSL enabled CAS from the internet. This would be my first phone that I’ve run across that didn’t automatically import the certificate. Now, let me begin by saying this is probably one of the dumbest things I’ve ever heard of before (not automatically importing the certificate) because if you’re connecting to the exchange server and authenticating…you should trust whatever certificate is setup by your administrator automatically. Locally here on our PC’s in the enterprise, we’ve automatically trusted the certificate from servers we can authenticate with passwords to. As an example, if Microsoft treated their Domain Controllers in an AD Forest the same way…we’d be getting pop-ups anytime I regenerated a certificate on a DC. We don’t get those because if a computer is authenticated and the server changes, we don’t want our users getting popups they can’t explain or understand. We used group policy to silently negotiate the certificate exchange in the background. We did the same for OWA when it is accessed internally. But a smart phone running Windows Mobile? Heck NO! You have to manually copy the certificate over and import it manually…you’re not given the opportunity to authenticate and import automatically. Nothing takes place in the background…even if you are ON THE DOMAIN. The behavior gives you no other alternative. I thought this would be fine…but it’s not. There isn’t a way for me to get access to the filesystem of the phone. I plug it in via USB. It can’t install it because it can’t find drivers. I use the software included with the phone and it wants to synchronize locally with Outlook…but the user that is using this phone DOESN’T HAVE OUTLOOK nor do they have their own PC, so why would they want to install software just to be able to get files onto their phone? Why would I? In this instance, this phone is locked down…which is fine in a corporate environment. But this is a personal phone and there is no corporate Windows Mobile plan we have here. I need it to be as easy as an iPhone. I need it to be as easy as my Palm Pre. I need to type in the information and have it connect and start working immediately. It doesn’t. Microsoft needs to work smarter and not harder on this. I wasted 2 hours yesterday trying to get a certificate copied over to the device and I still can’t do it. I pretty much gave up in frustration and figured I’d file an issue and see what someone can tell me…there comes a point though where security and usability collide in an awesome display of stupidity…and I think this is the case here. I’m sure everyone is saying “You’re a dummy then! It’s easy, you just perform action X and they Y and it works!” and to that I ask that you leave a comment on how you get it working…remember, I can’t copy files to this device…it won’t let me. So tell me how to get it done without copying files to the device or how to hack the device so I can copy files to it and I’ll agree with you by saying “yes, I am a dummy”. Documentation on this problem and solution are non-existent…google and live were not my friends on this topic. So please tell me how wrong I am…I want to be proved wrong and fix this. In the meantime, please Microsoft, work smarter and NOT harder. Making things this difficult to do simple things is dumb. My boss doesn’t care about all the technical details. She just knows that she took her iPhone in and I had it up and running in about 10 minutes. And now she knows that one of her directors asked for the same functionality in a Windows Mobile phone and 2 hours later I told him I couldn’t get it to work. Here it is 2 days later and I still can’t get it to work. Making it so competitors systems work better on your own product is comparable to shooting yourself in the foot with a canon.